Care South’s St Ives Country House Care, near Ringwood, has been nominated for the Best Care Village award in the national Pinders Healthcare Design Awards 2018. 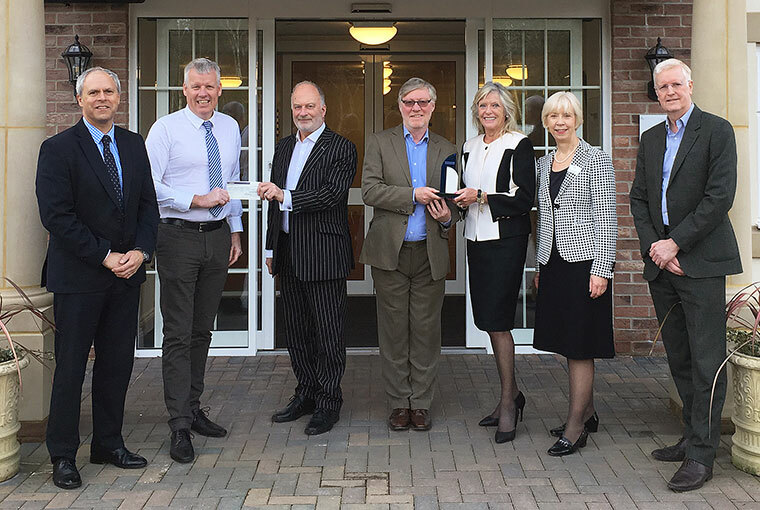 St Ives House is a newly-built, country house care home, offering specialist nursing, with residential and dementia care. The community development consists of St Ives House, a 60-bedroom care home with ensuite facilities, 24-hour care, themed lounges, bistro and a hair salon alongside St Ives Place, a collection of 14 one, two and three bedroom stylish apartments providing assisted living. There are also four three-bedroom country cottages. Judging of the awards took place at the home on 20 February with representatives from DWA, Tooley and Foster and Pinders on the panel. A final presentation will take place on 14 March. As a shortlisted finalist, Care South was awarded £500 to be donated to a charity of its choice. Care South nominated Lewis-Manning Hospice, based in Poole, which provides free care and support for local people at the end of life. Care South is a leading provider of residential and home care services across the south of England. Care South has care homes in Dorset, North Devon, Somerset and West Sussex, and home care offices covering Dorset, Bath and North East Somerset, and South Somerset.